I hear when you get back from Antarctica after working there for a year, you get headaches from all the color. That makes sense to me, I can imagine that. All that snowy white can be so brilliant, but it’s not the same as a really red coat, or the riot of color that is a walk on a crowded beach. Sometimes, when I walk on my beach, and all I see is skin and bikinis and bright blankets and violent clashes of neon, I have to come into my room and lie down. I don’t think I could do Antarctica. It’s too bad, because I would love to be melancholy for lack of shades of green. I would love to be heartsick over a lack of chartreuse. It would be like I was in love with the color test on television and she wasn’t answering any of my calls or texts or e-mails or letters. I never get that much emotion over our color spectrum, and I’d like to. The paint is peeling in this drab little beach house. The red brick is showing through, and I hate that red brick. If I were in Antarctica, that brick would be what I would dream about. I imagine grey cement breeze blocks would be the norm for the living situation if you worked in Antarctica. I bet my fellow scientists or janitors would try to liven things up a bit with photos and patriotic flags from whatever country they came from, but I wouldn’t. I would just live with the sweet ache for color. What’s the drabbest color that food comes in? Today, the world was painted in gray for a short while – the fog rolled in that morning and didn’t roll back out for hours, the sea was grey with white tops, hundreds of seagulls were enjoying my rooftop. I can hear them walk on the aluminum, and it isn’t annoying like I thought it would be. It’s soothing, a reminder that there is real life out there. When I close my eyes to get away from the brick, I think about those seagull feet replaced with penguin’s. I want to look outside and sea a polar bear ice fishing, and for a moment I can almost convince myself. I go to my window and look out, readying myself for disappointment, when I see a girl shedding a padded jacket revealing a white bikini underneath, laying out a towel and acting like the fog is a side effect of sunshine. She’s slathering on sun screen. She is a crazy person. I want to go out to meet her but all I can think about is Antarctica. I don’t think she would want to talk about Antarctica, but it’s what is on my mind. I could ask her about fog bathing. Is it good for the skin? Or maybe I could just sidle up next to her, put down my own towel, ask to borrow her sun screen. I don’t do either, because I don’t want to disturb her. She’s rummaging through her bag, she’s looking for something. Sunglasses. I throw open my window to see if she is noticing something I’m not, because I can hardly see the grey ocean through the murk. She is imagining all that sun, I am imagining so much snow. I like her white swimsuit. I think that would work in the mandatory swimming pool in Antarctica, although I wouldn’t go if people wore the bright colored madness they wear here. If I finally escaped the maddening color of the world, I’m not sure I would ever come back. She is twiddling her fingers in the sand, and I decide I have to go out and talk to her. Outside, the mist and fog is so thick I feel like I could fill a glass of water just by whisking it around. I wander over to her blanket and ask if I can join her. I wait. A beam of light shines through the fog like a beacon or a lighthouse, and then the fog decides it had someplace better to be. The clouds lift, the sea turns its normal shade, and already I see cars filing out of the houses and driving the short would-be walk to the beach. I flop down next to her in my coat and ask her the only thing I can think to ask her. She looks puzzled for a second, or at least her eyebrows do. I want to reach over and take off the shades and break them in half so that we can have a normal conversation, but I notice that my hair is all wrong and the puffy coat I’m wearing makes me look frumpy, so I try not to be violent. I look around and I see that the beach is filling up with all of these people that I cannot stand, all of this color that my eyes hate drinking. The sky is blue with white cloud remnants and I look back to my house and notice that the aluminum is rusting. The grey is losing its normal shade of grey and becoming that ruddy red. “I can’t imagine it,” I say. I get up and brush the sand off when I realize I have nothing to tell this girl. She tugs on the hem of my jeans. “I’d go, just to feel that,” She says. Posted on Wednesday June 30th, 2010 Friday July 22nd, 2016 by Max Elman. 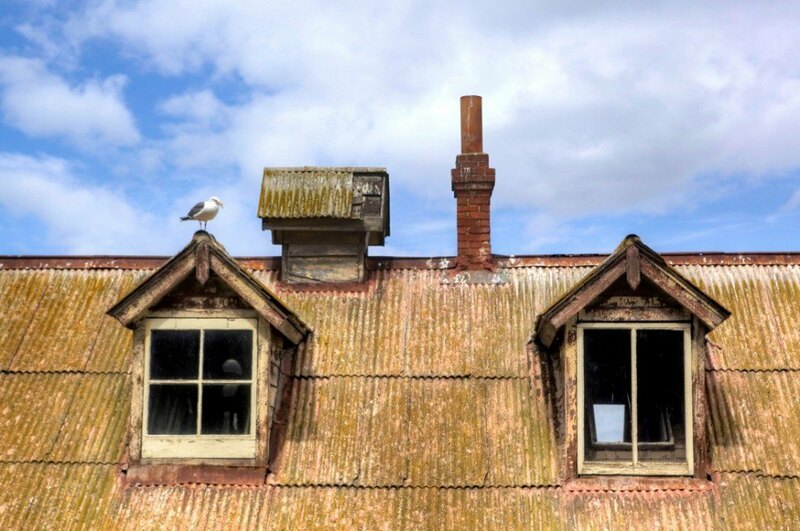 This entry was posted in Photos & Stories and tagged beach, birds, daytime, hdr, house, seagull. Bookmark the permalink.